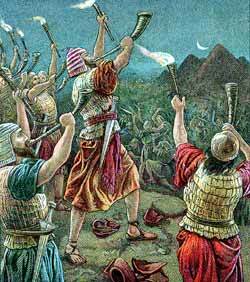 Gideon's three hundred men blow their trumpets. HE CHILDREN OF Israel did evil in the sight of the Lord; and the Lord delivered them into the hand of Midian for seven years. The Israelites took refuge in dens and strongholds in the mountains, and in caves. At harvest time, when the crops which had been sown by the Israelites were ready for the reaping, the Midianites came with their numbers of camels and ate up the crops. They were in great numbers like grasshoppers, and when they left, the land was bare, with no food for man or beast. The children of Israel cried out to God and wanted to know why this great trouble had come upon them, and He sent them a prophet to tell them that it was because He had brought them up out of Egypt, and had delivered them from all oppression, and He had told them not to worship the gods of the country in which they lived, for He was the Lord their God; but they had not obeyed Him, and for this they were being punished. There was a man among the Israelites who did not want to worship any but Jehovah. His name was Gideon, and one day as he sat threshing wheat by the wine-press to hide it from the Midianites, an angel of the Lord appeared and spoke to him, saying, "The Lord is with you, mighty man of valour." "I have chosen you to save Israel." "Who has done this thing?" they shouted. Then the men of the city went to Joash, Gideon's father, and they asked him to send his son out, that he might be put to death. Gideon's father refused, saying, "Why should you plead for Baal? If he is a god, he should plead for himself against the one who has wronged him." Then all the Midianites and the Amalekites and the children of the east were gathered together, and went over, and pitched in the valley of Jezreel. The Spirit of the Lord came upon Gideon, and he blew a trumpet, and called a great army together. But before he sat out to save Israel, he wanted to be sure that he was the one chosen to do it, so he said to God: "If I am the one chosen to this task, I should like a sign. I will put this fleece of wool upon the earth. If the dew forms on the fleece, but not on the earth, I will know that it is indeed so." "I dreamed," said the man, "and lo, a cake of barley bread tumbled into the host of Midian, and came to a tent, and smote it that it fell and overturned it, and the tent lay along." And the other answered, "This is nothing else save that sword of Gideon, for into his hand hath God delivered Midian and all the host. " He called up his three hundred men, and gave each of them empty pitchers and lamps and trumpets. Then he led them to the enemy camp. When they came to the camp, the three companies blew with their trumpets, broke the pitchers, so that the lights shone out, and shouted, "The sword of Jehovah and of Gideon."